A House Divided is one of the more interesting episodes of Telltale Games’ The Walking Dead, across both seasons, so far. Clementine has been through a lot (to say the least) since she was first introduced to us. Growing up in this world has made her far tougher and grown up than she should be at her age and she has pretty much nothing left to fight for except herself and yet still finds a way to carry on. But perhaps most devastatingly the worst is probably yet to come, and that could be just around the corner in an episode that nicely sets up how the rest of this season will play out. One of the best character introductions so far this season is that of Carver, voiced by the impeccable Michael Madsen. From the second he hits the screen you immediately feel unnerved by his cigarette and whiskey soaked tones, but there is also a slight sense of maybe he is just being unfairly represented. Just because you have a deep voice doesn't make you a bad guy and this element of which way a person will go is something which is heavily present throughout the whole episode. Trust plays a huge part in this world as knowing who to side with can really be the difference between life and death. 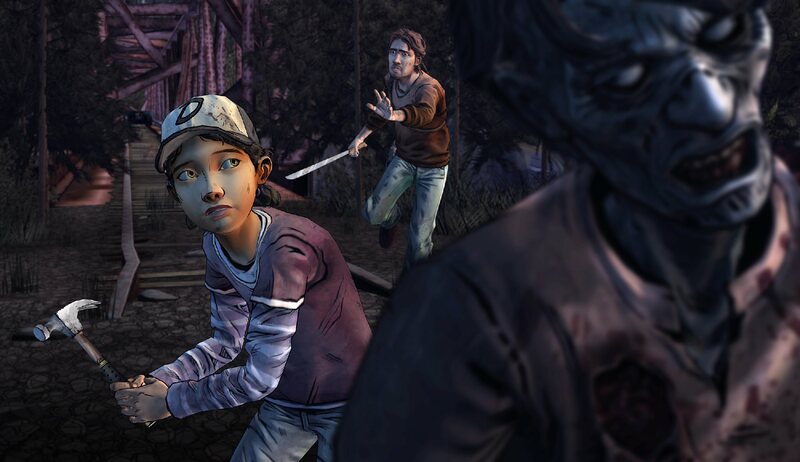 This episode plays out like a civil war, with Clementine stuck right in the middle. We see two clear factions developing with people we both like and dislike on both sides, and choosing where to lay our allegiances is rather difficult. We are constantly being pulled both ways and it doesn't feel nice. Something as simple as choosing where to sit to eat dinner becomes one of the most difficult decisions you have to make as you don’t want to alienate either group. Ultimately you can only look after yourself and if certain people don’t like you, so be it. You can chose to align with a few individuals to help you along the way, but in the end it is just you against the world. A world that is out to kill you at every second. There are more references to previous events here than we have ever seen before, pulling you in emotionally by bringing up the past. Lee’s presence is still felt as he is mentioned by name on several occasions and is a constant reminder of both the best and worst this world has to offer to a young girl trying to survive. It doesn't feel gratuitous though, and makes sense in the story after the impact he has had on so many people to be a strong influence on the remaining survivors. Many wondered if Clementine would return for this season let alone be the protagonist and we speculated how things may play out. Introducing an entirely new plot inside the same universe would have been nice but with how invested we are in this character, it would have been a complete waste of something special. It is becoming increasingly more obvious than ever before how important she is to this franchise, as this whole thing could completely fall apart without her. New characters can come and go so quickly, it could become slightly close to all feeling rather pointless. If we don’t have enough time to establish a connection with someone, I really don’t care what happens to them. Without Clementine, we have no stakes. I hope other characters get enough time to build a status within the game, and this episode does this job far better than previously with Carver’s introduction, but perhaps having only one star of the show could potentially hurt the franchise in the future. Only time will tell. Also present are some of the best dialogue scenes Telltale have crafted and they seem to just be improving as time goes on. The options we are given to certain situations all feel very natural and what we might actually say given the chance. It goes beyond just completely agreeing or disagreeing with someone and helps to further blur the already fuzzy lines of trust in the narrative. The lack of action in the episode wasn't a problem at all and perfectly showcased how it isn't really needed. It didn't feel dialogue heavy as the tension on offer did more than enough to pull me in than any scene involving killing a bunch of walkers ever could. When the story is at its best, it does the talking. Also it is with great happiness that I can report I experienced zero issues with the game during my entire playthrough on the Xbox 360. Every episode of both seasons so far have at least some small frame rate issues and I wondered if it was just a problem with their engine which would never be fixed on this platform. It seems that is not the case and this small niggling problem I've had for sometime should now hopefully be a thing of the past. The final moments are the perfect conclusion to the episode and one of the most tense situations we have ever been forced to endure. It equally sums up an episode while also setting up the next, a fine balance to strike which has been executed here perfectly. The length was exactly what we have grown to expect at this point and doesn't drag or rush by too soon. I always feel left wanting more in the best way possible. Since Telltale released the first ever episode of The Walking Dead back in 2012, I've slightly wondered when they are gonna finally slip up. Maybe release one episode that is way below the standard and we all ponder if they can get back on top. Sure, some episodes have been better than others but the overall standard of each episode has been incredible when you stop and think about it. If this were a TV show we would be applauding how it continues to deliver over and over again, and I only hope this fantastic trend continues throughout the rest of the season. Tense plot sets up the next episode perfectly. Past events impact the present beautifully. No frame rate issues for the first time. Supporting cast sometimes feel too disposable.